I’m always trying to give you ways to make your workouts more interesting and fun, while also stimulating big-time results. Don’t you agree that your training should be fun? This is what separates the people who jump on and off the “fitness bandwagon” a couple of times every year without ever making any real progress from the people who actually adopt a true fitness lifestyle and finally achieve the body they have always wanted. Make it interesting, make it fun, and make your fitness a priority, and you’ll have the body that you want. What I have noticed over the years is that many people will train regularly for a few months and then will either get bored with the same old weight training and cardio routines, or will get discouraged because their progress comes to a grinding halt after a while. In my opinion, I don’t think your workouts ever need to get boring or stale. You just need to have an open mind to the huge world of various training styles and techniques that are out there. Seriously, there are so many different and fun training styles out there, that there is no reason you should ever get bored with your workouts and give up on that lean ripped body that you’ve been looking for. Also, mixing in various training styles builds stronger joints by reducing repetitive movement pattern overload and varying your training stressors. Now before I start with some of my favorite non-traditional training styles, I will state that I think one of the best ways to achieve a lean, muscular and healthy body is through a consistent weight training routine with free weights. You can choose to integrate some of these alternative training techniques with your weight training routines on the same day, as alternative workouts on separate days of the week, or even as separate training cycles where you try some of these techniques for several weeks at a time before cycling back to a traditional weight training workout. Try some of these training styles out and you’ll be on your way to never being bored again with your workouts…and your body will thank you with muscles popping out that you never knew existed! 1. Staircase Workouts – This is great because stairs are everywhere. You can go to a football field and do stadium stairs, any building that has stairs like a hotel (most people take the elevator, so you will not even have many people looking at you while you’re working out), or even the stairs in your own home. For an awesome full body workout, try mixing stairs sprints with an upper body exercise like push ups or pull-ups. If done with a high enough intensity, stairs workouts help to create changes throughout your entire body due to the muscle-building and fat burning hormonal response and metabolism increase that you get through working the biggest muscle groups in your entire body. If you thought that going up and down the stairs was the only way to get a good stairs workout…think again. My fellow trainer and friend, Virgil Aponte, has developed a website that focuses on creative stairs workouts using all kinds of exercises you never would have thought of before. You can find out more info on stairs exercises workouts HERE. Just look at any world-class 100-meter sprinters and notice how ripped-to-shreds those guys are. Now compare that to the emaciated weakling physiques of many marathoner, and you’ll see that sprinting is where the action is at for a healthy, ripped, powerful body! Now I don’t want to upset all of you, distance runners out there. 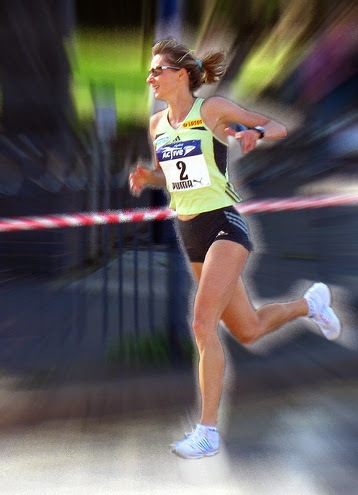 Hey, if distance running is something you enjoy, then go right ahead. But don’t say you’re doing it for the health benefits, because I might just have to disagree. You can read the full story of a professional why I believe variable intensity training is far superior to steady-state endurance training in one of his ezinearticles.com articles at Cardio-Enthusiasts: Discover a More Effective Training Method for Fat Loss and Heart Health! 3. Kettle-bell Training – If you’ve been reading my articles for some time, you’ve probably heard me praise kettle-bell training many times before, but I will have to reiterate that it has been one of the best training methods that I’ve ever tried and has taken my physical capabilities to a whole new level. Kettlebells are an alternative type of free-weight training instead of – and dumbbells. Their unique construction and weight distribution (basically a cannonball with a handle) allows for a whole different realm of exercises that’s available compared to dumbbells and barbels. Kettlebells have been typically used for training hard-core athletes, military units, martial arts competitors, and other tough individuals, but there is no reason that anybody looking to get stronger, bigger, or more cut can’t learn the exercises and benefit from them. p over any high bar like a pull-up bar, the top of a power rack, or even over a football field goal crossbar. Then you can quickly adjust the rings to do exercises like ring dips, ring push ups, ring pull-ups, hanging leg raises, horizontal body rows, L-sits, and more. Dips and push ups on the rings are my favorites and the rings really make them a hell of a lot more difficult, while also incorporating your stabilizer muscles to a much greater degree. The rings allow your joints to move in a more natural pattern and can help you prevent or even recover from shoulder injuries. Personally, when I try dips on a normal dip stand, it hurts my shoulders. However, dips on the training rings feel perfect, and also give me a much better muscle pump. The training rings are one of the best training devices I’ve ever bought. Give them a try…I think you’ll like them if you’re up for a challenge. I found my rings, which you can hang up easily on a power rack, pull-up bars, or at a park, at ring-training.com. 6. Swimming – A great full body workout that stresses the muscles and joints in a much different way than most resistance training. Incorporating swimming workouts once or twice a week into your normal training routines can really enhance your physique. I recommend trying a “sprint” style swimming workout, which will help more for building muscle compared with endurance long distance swimming. For sprint style, swim as hard as you can to the other side of a 25-meter or 50-meter pool (or sprint swim similar distances in a lake or the ocean if you like to swim outdoors). Rest enough to catch your breath between sprint swims (about 20-40 seconds). Try to keep the rest intervals fairly short with swim sprints. 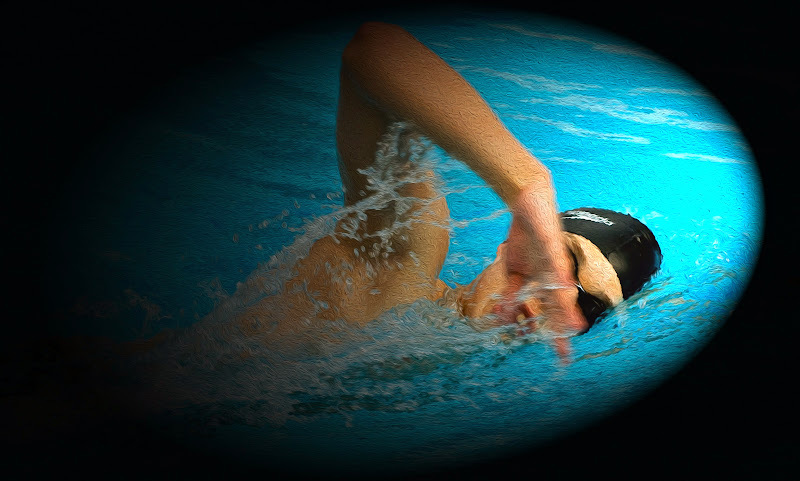 You can also mix different strokes (crawl, breaststroke, side stroke, backstroke, butterfly) on each swim sprint. I’ve found that sprint swimming gives me a great muscle pump (especially in the upper body), without any soreness the next day as is typical with weight training. This is because swimming has no eccentric movement (the negative portion of a lift), which is what causes muscle soreness. Keep in mind that even though swimming works your muscles well and is a nice alternative workout to mix in once or twice a week, it does not strengthen your bones. You still need to do regular weight training to do that. 7. Sandbag Training – This form of training is a nice variation to mix in with your strength training. It works your body with an unstable object, which makes muscles that might normally be neglected get in on the action to perform the movements. I’ve been mixing some sandbag training into my routines for over a year now, and I’ve found it is a very intense method of training that works your muscles in a different way and gets you huffing and puffing like crazy. You can make your own sandbags to train with by filling various sized duffle bags with sand, or you can use those construction type sandbags that come in several shapes. Sandbag exercises can be done as squats, cleans, presses, lunges, shouldering, throws or heaves, carrying up hills, etc. Make no mistake, training intensely with sandbags will get you ripped in no time flat! I’ve actually found an entire book devoted to sandbag training, which gave me some great ideas for doing sandbag based workouts. If you’re interested in this type of training, you can find more info at my ‘fitness products’ page at truthaboutabs.com at the link below. 8. 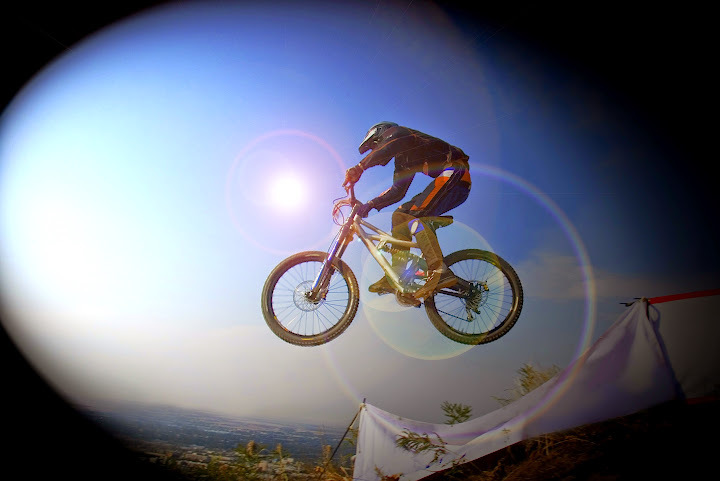 Mountain Biking – As you may have figured by now, I’m not a proponent of steady pace endurance exercise, but rather, highly variable intensity exercise that works with bursts of exertion followed by recovery intervals. Well, mountain biking fits this bill perfectly. You get the leg pumping exertion during the uphill climbs, while also getting the adrenaline rush of the downhill acting as your recovery intervals. Mix it all together and you get a super-fun, high-intensity, leg burning workout that will melt fat off of your entire body and build awesome legs at the same time. The climbs can be tough and will challenge you both physically and mentally as you pump away trying to make it up steep hills without having to resort to getting off of the bike. Then after you make it up the challenging climbs, you get rewarded with the adrenaline rush of flying down steep hills while jumping off of boulders and logs and trying not to stumble or fall off the bike. It’s such an addicting thrill…I love it! See, who says that working out has to be boring! 9. Indoor (or outdoor) Rock Climbing – This is yet another fun way to get in a great workout that will also challenge you both physically and mentally. Indoor rock climbing gyms have starting popping up all over the place in recent years and will be more accessible than outdoor rock climbing to most people. Rock climbing is a great workout for your legs, arms, shoulders, and your entire back. It also really works your grip strength and forearms like crazy. Whenever I go indoor rock climbing (which is only on occasion), my forearms are sore for about 2-3 days afterwards. Give it a try if you’ve never done it…it may be just what you’re looking for to spice up your fitness routine. 10. Stick Wrestling – This is a killer full body workout and can also be a great competition between you and your friends. This is probably more of a guy thing for most people. You could even come up with your own “fight club” and have stick wrestling competitions with your buddies to see who is toughest. There are actually sticks designed specifically for stick wresting, but you can even just use a strong broomstick cut down to about 30-36 inches long and taped up with some athletic tape to prevent splinters. For your stick wrestling workout, stand on a soft mat or carpeted area (or grass if outdoors), match up with a friend or foe. You’ll both grab the same stick toward the ends with your hands on the outsides of your partner’s hands, on the inside, or staggered. Then you simply push, pull, jerk, and thrash your opponent around trying to knock them off-balance until they either fall or lose their grip of the stick…and you win that round! Be careful not to get the stick up high and knock each other in the face. Use common sense. You can do this in 1-2 minute rounds or just keep going until someone gives up. Be creative and keep going until you’ve gotten a killer workout. Your forearms and legs will be screaming! 11. Strongman Training – This type of training is a little more hard-core, but it’s a blast for those who are into trying something different. The premise is based on the types of exercises competitors perform in the “worlds strongest man” competitions. If you have a yard, you can even set up some of these exercises in your yard and do some outdoor workouts to have a little fun. Your neighbors will probably give you some funny looks, but it’s fun, so who cares! You can get one of those giant tractor tires and do tire flips (which is basically a dead-lift followed by a push-press). You can also try your hand at log lifts, boulder lifts and carries, keg lifts and tosses, weighted sled dragging…anything that involves pulling, pushing, lifting, or heaving any types of odd objects. You don’t need to be a monster to enjoy this type of training…just handle whatever size objects are challenging for your individual strength. Strongman training works your entire body in a very intense fashion and could easily spark some new results. If you’re interested in finding out more ideas for strongman training, check out my ‘fitness products’ page at truthaboutabs.com at the link below. 12. Rope Climbing – This goes back to the old high school days of climbing the rope in gym class. Seriously, if you have access to a rope, either at a gym or somewhere outdoors, rope climbing builds a powerful and ripped upper body like no other exercise. A great way to incorporate rope climbing into intense workouts is to do a climb up, then lower yourself back down. Then while your upper body is recovering for the next climb, you can do a lower body exercise like squats or lunges, or go up and down stairs. Keep alternating the upper body rope climbs with the lower body exercises in between and you’ll get one hell of a full body workout. 14. Rope Skipping – You can’t beat rope jumping as a great full body exercise. I like to use it as a warm-up for my weight training workouts. I prefer to use the really cheap “speed” ropes with a plastic rope instead of a fabric rope. Once you get good, you can jump rope much faster with the plastic ropes than the fabric ones, which will allow you to get a more intense workout. And don’t mess with the weighted handle ropes…they’ll just slow you down. Your goal is speed when rope skipping. Try mixing together two-legged jumps, one-legged jumps, arm crossovers, double jumps (rope passes under feet twice for each jump) to keep things interesting and increase the intensity. Also, try alternating 15-20 second high intensity bursts where you jump as fast as you possibly can, followed by 15-20 second recovery intervals where you jump slowly to get ready for your next burst. Keep repeating until you’re whooped, which might happen pretty quick! 15. Jumping exercises – squat jumps, box jumps, lunge jumps, and broad jumps are some of the best ways to incorporate explosive jumping exercises into your routines. The explosive and powerful nature of jumping exercises works your leg muscles in an entirely different way than most normal slow grinding strength training moves. I’ve even seen a university study cited once that found squat jumps to elicit the greatest testosterone response of all exercises studied. That means more muscle and less fat on your entire body, not just your legs. Try super-setting jumping exercises with upper body exercises for some really intense workouts. Well, I hope you’ve enjoyed all of these ideas for ways to really shake up your workouts and make them fun again. I know some of them may seem a little “out there”, but open your mind to the possibilities and you’ll never be bored again…and your body will respond with new-found results!